Feilden Clegg Bradley Studios have recently completed the new Discovery Centre for the famous Jodrell Bank Observatory. 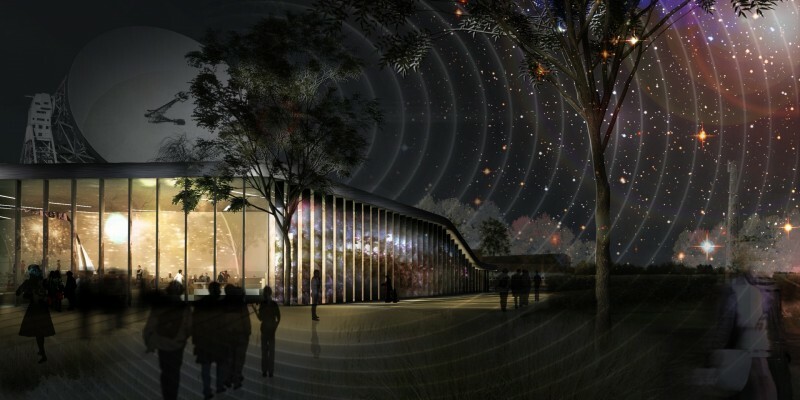 Designed for the University of Manchester’s Centre for Astrophysics the projects include two new Visitor and Exhibition Pavilions which have been built to inspire budding young scientists and showcase cutting-edge research ‘as it happens’. Located directly adjacent to the Grade I listed Lovell Telescope the design of the buildings is inspired by this historic landmark and its setting in the surrounding landscape. • A Planet Pavilion entrance building including an orientation centre and stylish glass-walled café with spectacular views of the Lovell Telescope. The building features an embossed artwork across the 55 metre long front elevation representing our galaxy as captured by the Lovell Radio Telescope. • A Space Pavilion incorporating a multi-purpose event space and education pod as part of an interactive ‘Live Science’ exhibition space. The building opens out onto a large terrace giving visitors the opportunity to get up close to the Lovell Telescope to see and hear it work while it turns and rotates during the observations. • New landscaping to guide visitors towards the telescope and improved visitor footpaths in the Arboretum. The landscape works also include a ‘Galaxy Maze’ landscape installation within the Arboretum, designed by garden designer and TV presenter Chris Beardshaw. “Working on the new Discovery Centre at the Jodrell Bank Observatory is a great opportunity for us. The Mark I Lovell Telescope is such an inspirational piece of engineering and has a great sculptural quality to it, it feels so out of place yet it has become such an important landmark. The scale of it is really interesting too as it seems to change, depending on how far away from it you are. The most amazing experience is when you can get up close to it and the telescope starts to move effortlessly which is something you wouldn’t expect from an object this size. The design for two new visitor pavilions is inspired by the telescope but we wanted to set the buildings more into the landscape and provide a chary backdrop for the visitor experience which predominantly focuses on the Lovell Telescope, the landscape in the adjacent arboretum and the live-science exhibition. We chose a steel construction for the buildings and a metal faced façade cladding to pick up on the telescope’s structure but also aimed for a very planar and simple façade to contrast against the Lovell Telescope’s intricate and complex frame design. Jodrell is the site of the global design headquarters of the world’s next-generation radio telescope, the € 1.5 billion Square Kilometre Array, due to become operational in 2024. The telescope is named after the Sir Bernard Lovell, an English physicist and radio astronomer who was the first director of Jodrell The design for the façade of the Planet Pavilion is of the 408 MHz Map (radio map of the Universe created by radio astronomers 17 years ago) The Discovery Centre aims to attract 120,000 visitors compared to last years 80,000.